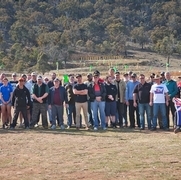 One of the Premier Long Range Benchrest events in Australia. 500m Fly shooting tests even the best shooters and equipment at a variety of S.S.A.A. ranges around Australia. These Rule Books are attached as resources for your use. Australia has a population around 25 Million, Texas about 28 Million - Game on ! !